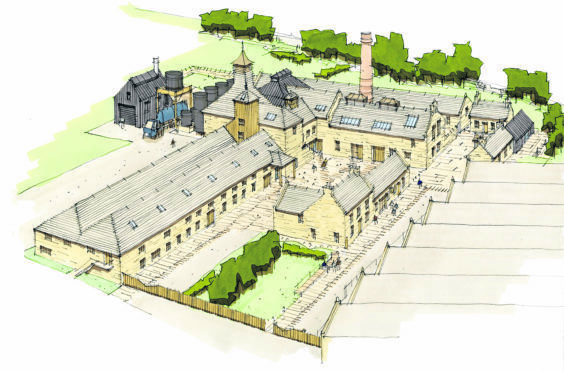 Artist's impression of the Brora Distillery. Plans have been submitted for the reopening of “lost” malt whisky distillery closed for more than three decades – a move that could inject millions of pounds into the economy of a remote Highland village. Plans for the revival of the iconic Brora Distillery have been submitted to Highland Council – 35 years after it closed. The proposal, part of a £35million reinvestment programme including Port Ellen Distillery in Islay, focuses on restoring and renovating the original 19th century stone buildings which remain largely intact from when the distillery closed its doors in 1983. Stewart Bowman, the Brora Distillery project implementation manager, said: “This is an important milestone for us at Brora. “We are very lucky that we have beautiful buildings to work with and we plan to work carefully to restore the exteriors of those buildings, remaining true to their original character while preparing the interior to once more produce the finest distilled liquid. Diageo, one of the world’s leading Scotch Whisky producers, announced plans to reopen Brora and Port Ellen Distilleries as part of its investment programme. Highland economist Tony Mackay hailed the move, saying: “This is excellent news for the Sutherland economy and the Highlands generally. “The reconstruction will involve expenditure of about £15 million pounds, which will create a lot of work for the local building industry and also specialist companies providing stills and other distillery equipment. “There will probably only be about 10 permanent jobs, because distilleries are now very capital intensive, but that number is very important for a small town like Brora. “The Sutherland economy has gone through a difficult period during the last few years but there has been a lot of good news recently. “The tourism industry has benefited from the fall in the value of the pound following the Brexit vote to leave the EU. “The best example of that is the success of the North Coast 500 initiative. Other recent examples include the re-opening of the Falls of Shin visitor centre. It is good to see that the new Brora distillery will also have a visitor centre. Local councillor Deirdre Mackay said: “I am delighted to see this next formal step towards the realisation of Diageo’s ambitious plans.